Rage Against The Machine guitarist and all round axe hero Tom Morello is set to release a third acoustic solo album, 'World Wide Rebel Songs', in late summer under his moniker of The Nightwatchman. The guitarist broke the news as he signed a new deal with US label New West Records. Morello told press: "I'm very excited to be working with New West. Their commitment to their artists is inspiring and I'm looking forward to fanning the flames of discontent with many Nightwatchman releases under their banner." The announcement will prove bittersweet for Rage Against The Machine fans who have been holding out for new material from the political rockers since their return to the live arena in 2007. In October last year, vocalist Zack De La Rocha told Chilean newspaper 'La Tercera': "We are working on a new album due out next year, perhaps summer for the northern hemisphere." However, the late summer scheduling of Morello's Nightwatchman release will mean a new album from Rage in the same period is unlikely. 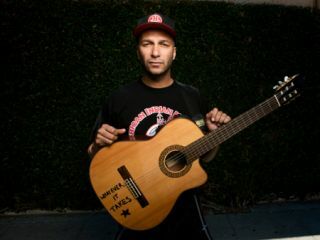 Fans of the politicised guitar whizz should check out our riff-focussed Tom Morello interview.